NYC Thin Crust Pizza, in Waterbury Vermont. From our famous NYC Style thin crust pizza to our generously stuffed sandwiches, on our house baked bread. We have something for everyone. In a hurry? Grab a slice or two or call ahead and we will have your order ready for you when you get here. 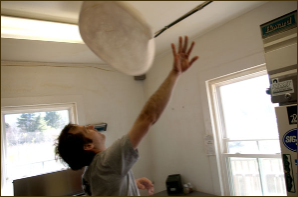 The dough for our hand tossed pizza and sandwiches is made here in our Waterbury Center shop then baked fresh in house. We use only the finest and freshest ingredients possible. Dine in, take away or delivery Jimmz is big city pizza right here in your backyard. Regardless if you’re a local, here for some fun in the snow, our beautiful autumn foliage or camping and hiking here in Waterbury Vermont, if your stop by and let’s get you some pizza. Jimmz Pizza Delivers to Waterbury and Waterbury Center. We also offer Pizza Catering for your party, or business event.